One of the best ways to help children become writers is to show them through example that writing has useful purposes in your life. Point out simple moments when you are writing and explain why. Let your four-year-old see you make a grocery list, write a thank-you note, text a relative, send an email, or write down a funny thing your child said! When your child watches you write and has access to their own writing and art materials, they will feel encouraged to explore the world of writing at their own pace — even if they aren't writing legible letters or words yet. Creating a post office in your own home can be as easy as decorating a shoe box and setting aside time and materials for everyone in your house to make cards or drawings for each other. Thick markers, crayons and paint brushes are ideal for the youngest writers since they are still developing the small muscles in their hands that help them hold tools. Likewise, large paper is best as they learn to control the size of their marks. Give them time each week to mark and color on blank paper; this will help them develop vital fine motor skills that will help them in the future. Tub letters, alphabet blocks, ABC puzzles and letter magnets are simple and often inexpensive toys that support literacy development. Tea parties are yummy and even more fun when they involve letters! Your child can practice writing letters and recognizing items that begin with the same letters, such as T-E-A! All it takes to make a book is paper and crayons/markers. Staple pieces of paper together or fold them in half, and then invite children to illustrate each page. Ask them to tell you what they have drawn, and then write it down under the picture. Once they have filled all the pages, read it back to them. At this age, it may be more a collection of images than a story, but children will love hearing their book read aloud to them! You and your child can build a book about the letter X and think of X words using this papercraft activity. You can put a new twist on a classic game with this fun I-Spy rhyming game. Can your child find something in the room that rhymes frog? Pig has a room full of words! Help your child find hidden words in the room and spell them together with Pig. 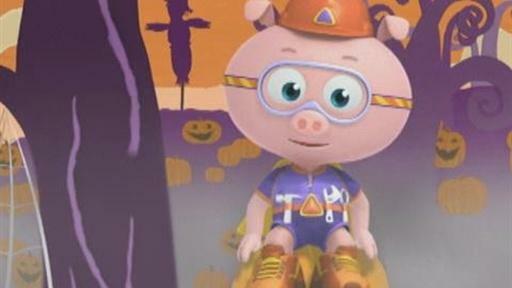 Your child can practice their spelling as they help Alpha Pig find the letters in the word pumpkin to make the pumkins come back. Your child can learn about the words "measure" and "pattern," while making costumes for Martha and Skits.